It was a sunny day and there was a great turnout to honour a great Edmontonian at the dedication ceremony for the new Michael Phair Park on 104 Street north of Jasper Avenue in downtown Edmonton. 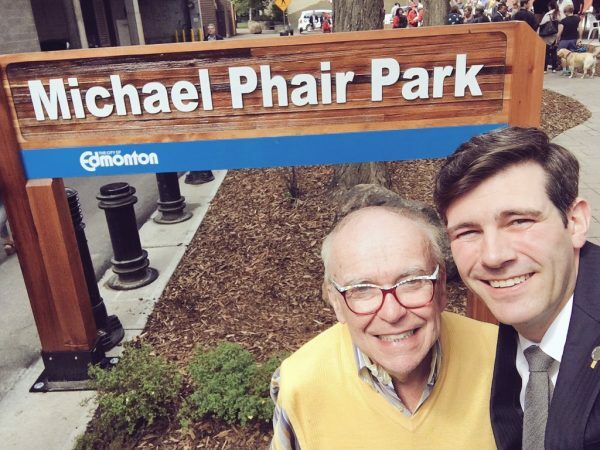 A strong advocate of urban renewal, Michael Phair was elected to Edmonton City Councillor from 1992 until 2007 and was the first openly gay elected politician in Alberta. He now serves as Chair of the University of Alberta Board of Governors. The dedication ceremony was also attended by some notable politicians, including Mayor Don Iveson, Councillor Scott McKeen, and Alberta’s Finance Minister Joe Ceci. This entry was posted in Alberta Politics and tagged Don Iveson, Edmonton Parks, Joe Ceci, Michael Phair, Michael Phair Park, Scott McKeen, University of Alberta, Urban Renewal on May 26, 2016 by Dave Cournoyer. 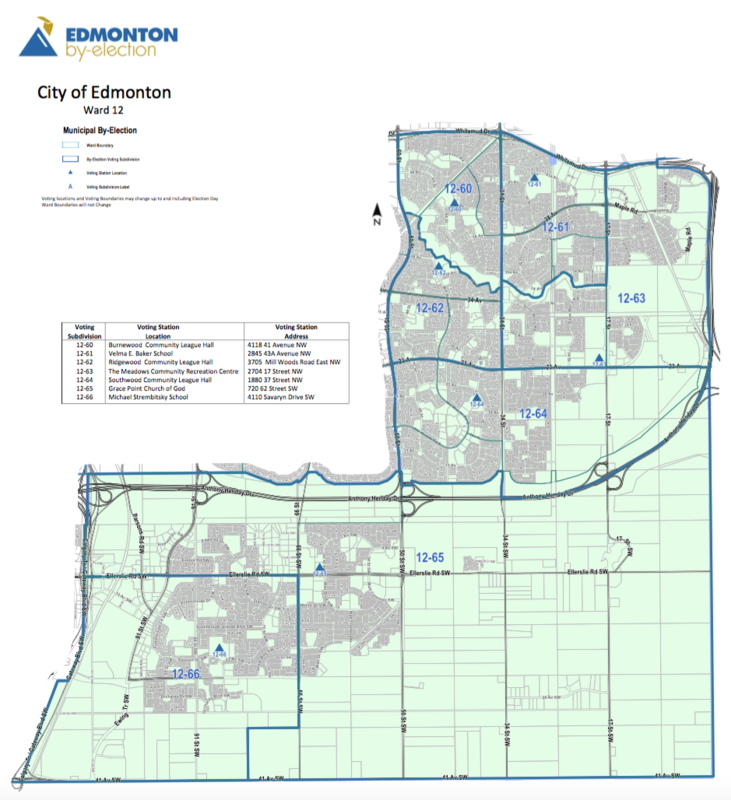 A map of Edmonton’s Ward 12. 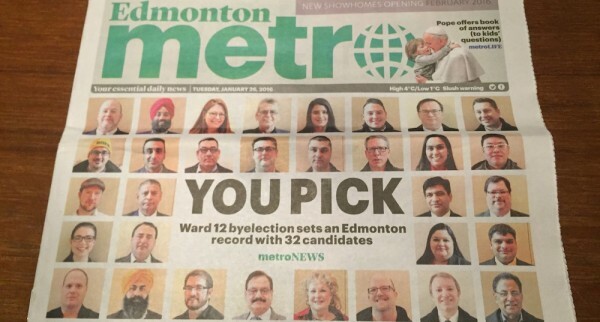 Thirty-two candidates will be listed on the ballot in the Feb. 22 by-election to fill Edmonton City Council’s Ward 12. With this many candidates on the ballot, it could be challenging for voters to choose who would best represent them on city council. It will also be challenging for those 32 candidates to break from the pack and distinguish themselves with less than a month until election day. Here are some ways these 32 candidates might break from pack. Having voters who already recognize your name will be an advantage for some candidates, as long as that recognition is positive. Because there are no formal political parties at the municipal level, all candidates will be running on their own names. Laura Thibert has been the Catholic School Board Trustee from the area since 2010 and was briefly nominated as a Wildrose Party candidate before the 2015 election. Balraj Manhas has been spokesperson for the United Cabbies during the recent city council debates about allowing Uber to operate in Edmonton. He was disqualified as a candidate in a Progressive Conservative nomination contest in early 2015. 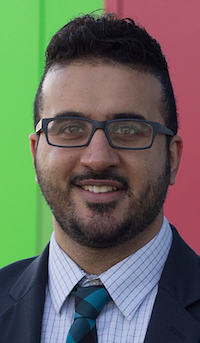 Mohinder Banga was briefly a candidate for the federal Conservative nomination in Edmonton-Mill Woods in 2015 before being disqualified. Don Koziak has run in at least eight municipal and provincial elections since 1995, including the mayoral race in 2007 and briefly in 2010, but he has never run as a candidate in this area of the city. He was the Wildrose Party candidate in Edmonton-Glenora in 2012 and 2015. Mike Butler ran as a Liberal and New Democratic Party candidate in this area in various provincial and federal elections since 2008. In 2014, he wrote an open letter explaining why he was leaving the Liberals to join the Alberta Party. Arundeep Singh Sandhu was until a few months ago the Vice-President of Organization of the Progressive Conservative Party. Andrew Gorman ran for city council in Ward 9 in the 2013 election, as did Dan “Can Man” Johnstone in Ward 10. There is no better way to identify your supporters and meet voters than showing up on their doorstep and ringing their doorbell. If you are a voter who lives in Ward 12, there is a very real possibility that you might have 32 different candidates knocking on your door before Feb. 22, 2016. Don’t be surprised to see candidates waving to traffic at busy intersections during rush hour, shaking hands at Tim Horton’s or showing up in droves at any community event before Election Day. There are already numerous all-candidate forums being organized by different community groups and organizations in Ward 12. With 32 candidates in the race, there might be little value in holding traditional question and answer forums, which will be time consuming, lengthy and uninteresting. Other candidate meeting formats, like the speed dating-style events held in the 2013 election, might prove to be more valuable for candidates and voters. The City of Edmonton is not hosting an official all-candidates forum during this by-election. The Women’s Advocacy Voice of Edmonton is hosting a forum on Feb. 5, 2016 at the Mill Woods Seniors and Multicultural Centre and the Mill Woods Presidents’ Council is hosting a forum on Feb. 17, 2016 at J. Percy Page High School. It is always difficult to determine what the defining issue of any election campaign will be, but that will not stop candidates from trying to get ahead of issues that are on the radar of voters in Ward 12. 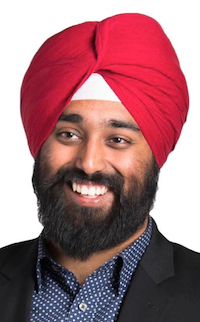 A number of candidates, including Nav Kaur, Balraj Manhas, Mohinder Banga, Arundeep Sandhu and Danisha Bhaloo, called on council to delay the vote on the new bylaw to govern vehicle-for-hire businesses that would include Uber until after the by-election. Nav Kaur outlined her position on her campaign blog. Sam Jhajj is hosting an open house at his campaign office to discuss and provide input into developing policies that can prevent domestic violence. Three candidates are calling on the city to delay construction of LRT to southeast Edmonton. Don Koziak told CBC that money going toward LRT would be better spent improving the city’s roads and intersections. Dan Johnston told basketofyegs.com that he would delay all future LRT construction. Kelly Kadla told the Edmonton Journal he wants a moratorium on the Valley LRT Line. Gimmicks might not be the best word, but candidates should be expected to use different tactics to get attention for themselves and the issues they are focusing on during this campaign. Nicole Szymanowka earned media attention for using the dating app Tinder as a campaign tool. Irfan Chaudhry and his supporters are sporting flashy yellow toques with his campaign hashtag #irFANclub. Nav Kaur tweeted her bus trip from her Mill Woods home to City Hall to demonstrate the need for improved public transit service to southeast Edmonton. Stephen Wutzke told the Edmonton Journal that if he is elected he will donate $20,000 of his annual salary to the Edmonton Food Bank. Jason Bale announced on his website that he will only spend $100 on his campaign to make a point about money in politics. In lieu of lawn signs, he is asking supporters to write ‘100’ in the snow in front of their homes and businesses. Endorsements from prominent community members will not win an election but they can lend credibility to candidates and their campaigns. 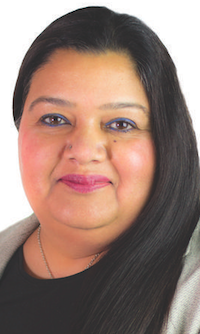 Nav Kaur has received the endorsements of Edmonton-Ellerslie MLA Rod Loyola, outspoken Catholic School Trustee Patricia Grell, Public School Board Trustee Michael Janz, former city councillor Michael Phair and recent federal Liberal candidate Beatrice Ghettuba. 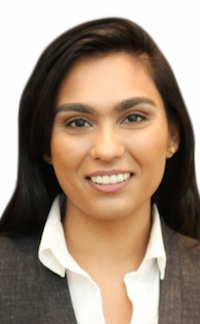 Danisha Bhaloo has received the endorsement of former Progressive Conservative MLA and former mayor Stephen Mandel, former Edmonton-Glenora PC MLA Heather Klimchuk and former Ward 5 city council candidate Dan St. Pierre, who is serving as her official agent. Laura Thibert has an endorsement from fellow Catholic Trustee Debbie Engel. Don Koziak has the support of former MP and MLA Brent Rathgeber, who is serving as his official agent. Here is the list of candidates who have registered their intentions to run, along with links to their websites and social media accounts. I will be posting any updates to the Ward 12 by-election webpage. Voting stations will be open in Ward 12 on Feb. 22 from 9:00 a.m. until 8:00 p.m. Advance polls are open at the Meadows Community Recreation Centre on Feb. 8, 9, 10 and 11 from 10:00 a.m. to 7:00 p.m. This entry was posted in Alberta Politics and tagged Amarjeet Sohi, Andrew Gorman, Arundeep Singh Sandhu, Balraj Manhas, Beatrice Ghettuba, Brent Rathgeber, Brian Henderson, Dan Johnstone, Dan St. Pierre, Danisha Bhaloo, Debbie Engel, Don Koziak, Edmonton Ward 12 By-Election, Edmonton-Ellerslie, Edmonton-Mill Woods, Field Pieterse, Heather Klimchuk, Irfan Chaudhry, Jagat Singh Sheoran, Jagdeep Singh Gill, Jason Bale, Jeri Stevens, Kelly Kadla, Laura Thibert, Lincoln Ho, LRT, Michael Janz, Michael Phair, Mike Butler, Mohinder Banga, Nav Kaur, Nick Chamchuk, Nicole Szymanowka, Nirpal Sekhon, Patricia Grell, Preet Toor, Rakesh Patel, Rod Loyola, Rory Koopmans, Sam Jhajj, Shani Ahmad, Stephen Mandel, Stephen Wutzke, Steve Toor, Taxi, Terry James McKinnon, Tinder, Uber, Victor Viorel Bujor, Yash Pal Sharma on January 27, 2016 by Dave Cournoyer. Michael Walters, Ray Martin jump into the municipal election. With much attention focused last week on Edmonton Mayor Stephen Mandel‘s harsh criticisms of the recent provincial budget, it may have been easy to miss news that candidates planning to seek election in this October’s municipal election are beginning to creep out of the woodwork. Community organizer Michael Walters launched his campaign this weekend in Edmonton City Council’s Ward 10. The Ward is being vacated by two-term Councillor Don Iveson, who announced last year that he would not seek re-election in Ward 10. Mr. Walters was the Alberta Party candidate in Edmonton-Rutherford in the 2012 provincial election and has recently been involved in local initiatives to redevelop the near-abandoned Petrolia Mall in the Greenfield neighbourhood. More than 200 people attended Mr. Walters’ campaign launch, including Ward 9 Councillor Bryan Anderson (who also recently announced his intentions to seek re-election), former Councillor Michael Phair, Edmonton-Riverview PC MLA Steven Young, former School Board Trustee Sue Huff, and past Liberal candidate Arif Khan. Speaking to a crowd of New Democrats gathered to celebrate his more than 30-year career in politics, former MLA Ray Martin announced his intention to seek election in Edmonton Public School Board’s Ward D in this October’s municipal elections. Ward D’s current Trustee, Dave Colburn, announced he will not seek re-election. If political candidates earned Air Miles for each time they ran in an election, Mr. Martin would be the New Democratic Party’s resident globetrotter. Having served as his party’s provincial leader and leader of the Official Opposition from 1984 to 1993, Mr. Martin has become his party’s most well-known standard bearer over the past thirty-years (at least). 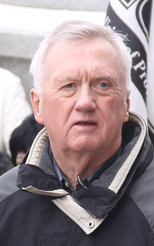 First elected as MLA for Edmonton-Norwood from 1982 to 1993, Mr. Martin returned to provincial politics in 2004, serving as Edmonton-Beverly-Clareview‘s MLA until 2008. Between his times in provincial politics, Mr. Martin was an elected trustee representing Ward D and was a perennial federal NDP candidate in Edmonton. Most recently, Mr. Martin ran as the NDP candidate in Edmonton-East in the 2008 and 2011 federal elections and in Edmonton-Glenora in the 2012 provincial election. 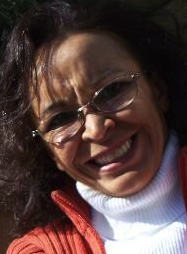 Writer and local activist Mimi Williams has announced her plans to challenge Councillor Tony Caterina in Ward 7 (Councillor Caterina is expected to seek re-election). A long-time NDP activist, Ms. Williams made her announcement at the NDP provincial council held last weekend in Edmonton. Her previous electoral experience includes runs for Edmonton Public School Board in 1995 and City Council in 1998, 2001, and 2004. Ms. Williams is expected to officially launch her campaign later this year. Check out the updated list of Edmonton Election 2013 candidates for more. This entry was posted in Edmonton Election and tagged Arif Khan, Bryan Anderson, Dave Colburn, Don Iveson, Michael Phair, Michael Walters, Ray Martin, Stephen Mandel, Steven Young, Sue Huff, Tony Caterina on April 8, 2013 by Dave Cournoyer. edmonton election 2010: the people in your neighbourhood. Depending on what part of Edmonton you live in, you have probably noticed the lawn signs beginning to line up on private front lawns and sprawled across City-owned boulevards. While I hear that the sign war is red hot in the closely contested Wards 3, 7, and 11, in my downtown Ward 6 I have only noticed signs from a handful of candidates (Michael Janz, Bev Sawyer, Brian Kaptiza, and Rudy Arcilla). Thus far there is virtually no signage belonging to incumbent Councillor Jane Batty in my neighborhood. This is a stark contrast from the last time I lived in this neighborhood during a municipal election. Back in 2004, I remember the area being covered with signs belonging to Councillors Michael Phair, Mrs. Batty, and then-challenger Ben Henderson (who is now standing for election in the new Ward 8 on the south side of the North Saskatchewan River). I spoke with Adam Rozenhart from The Unknown Studio earlier this week about my Nomination Day experience and shared some thoughts on the election candidates. You can listen to my conversation with Adam on The Unknown Studio website or download the podcast on iTunes. The conversation starts at the 11:36 mark and also includes a conversation about how my dog needed to be rushed to the Emergency Veterinary Clinic after getting his jaw stuck in his kennel door (he is fine now). There have been three City of Edmonton sponsored all-candidates forums held since Nomination Day in Wards 3, 7, and 11. They were all live-streamed online and should be posted shortly afterwards on the City of Edmonton election website. Jeff Samsonow wrote a thought-provoking article yesterday that raised some serious questions about how the media cover their colleagues who are jumping into politics. More specifically, Mr. Samsanow is referring to on-leave Edmonton Journal columnist Scott McKeen, who is standing for election in Ward 7. Journal columnist Todd Babiak shared some of his thoughts on the Edmonton Commons blog, but did not really address the issue that Mr. Samsonow was getting at. Scanning some of the candidates websites over the past few days has revealed some interested gems. Who would have thought that the people in your neighbourhood were such a colourful bunch? For example, did you know that the guy living down the street believes that the relationship between North Edmonton and South Edmonton is similar to North Korea and South Korea? Ward 3 candidate John Oplanich says so on his website. The Northside has been ignored for far too long at the expense of the Southside/Westend/Millwoods and City Council (Ron Hayter, Kim Krushell, Ed Gibbons, Tony Caterina) has allowed this to happen. The southside/westend /Millwoods continues to flourish, prosper and live in luxury as the northside is drowning in controversy – City Center Airport/CN Railway in Calder. For 80 years we have called this corridor a Wasteland-Dead Zone. Can we afford to wait another 40 years? We need a strong and clear voice on City Council. VOTE for CHANGE. I‘m starting to feel like I live in North Korea and on the opposite side of the river is beautiful South Korea. Country music singer KD Lang has some kind words to say about Councillor Bryan Anderson, who is running for re-election in Ward 9. Meanwhile, retiring Trustee Gerry Gibeault is sharing some advice from his fifteen years on the Edmonton Public School Board: School Board Secrets. One political watcher close to the public school board has told to me that the online presence of this normally low-profile Trustee in this campaign could signal Mr. Gibeault’s desire for more than just a quiet retirement. The source suggested that Mr. Gibeault could be interested in a return to provincial politics in the near future. He was the NDP MLA for Edmonton-Mill Woods from 1986 to 1993. Mayoral candidates targeted the vote rich communities of Senior citizens in the City today. Mayor Stephen Mandel announced plans today about Seniors Housing and Recreation. The Seniors Housing plan proposes more cooperation between the City, the Province, Builders, and Seniors Groups to expand the number of seniors housing units available in Edmonton. The first Mayoral all-candidates forum will be held tonight at Harry Ainley School from 7:00pm to 9:00pm. I will be there live-tweeting (follow @davecournoyer and #yegvote) and will provide some reflections on the debate later tonight. 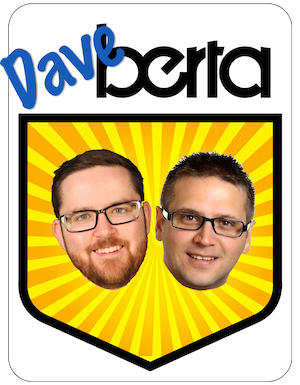 This entry was posted in Edmonton Politics and tagged Adam Rozenhart, Ben Henderson, Bev Sawyer, Bryan Anderson, Bryan Kapitza, David Dorward, Ed Gibbons, Gerry Gibeault, Jane Batty, Jeff Samsonow, John Oplanich, KD Lang, Kim Krushell, Michael Janz, Michael Phair, Ron Hayter, Rudy Arcilla, Scott McKeen, Scott Robb, Stephen Mandel, Todd Babiak, Tony Caterina on September 23, 2010 by Dave Cournoyer. my edmonton: reshaping the urban core. The petitions have been delivered and it appears likely that there will be a plebiscite deciding the future of the City Centre Airport lands on October 18. After a two-month long petition drive, the Envision Edmonton lobby group claim that they have collected the signatures needed to support a vote on the issue. If the signatures are successfully validated by officials from the City Clerk’s Office, City Council will likely begin the process of creating a question that Edmontonians can vote on in the October 18 election. As a citizen who has been involved in this debate for the past two years, I am looking forward to sharing why I support the redevelopment of the City Centre Airport lands and why I believe our City will benefit from this redevelopment. If a plebiscite is held, it will be a heated debate with passionate Edmontonians on both sides presenting their arguments for and against the closure. Envision Edmonton has talked about turning the Airport into a hub for aviation training and industrial development. Unfortunately, their proposal has largely been overshadowed by a public feud between Envision spokesman Charles Allard and Mayor Stephen Mandel. I disagree with Mr. Allard’s position, but I recognize and respect that the Edmontonians participating in this debate want what they believe is best for our City. A few months ago, I outlined some of the challenges and positive opportunities facing our downtown and urban core. Over the next two months I will expand on these ideas and the opportunities presented by redeveloping the City Centre Airport lands. We have a unique chance to do something that most similar mid-sized North American cities would envy. The benefits of new smart communities filled with residential and commercial development could reshape our City’s urban core for the positive. The chance to break away from the traditional urban sprawl and reshape the urban core makes me excited to call Edmonton home. I was glad to read that former City Councillors Michael Phair and Patricia Mackenzie have also shared their optimism for the redevelopment. As the October 18 election approaches, I hope that Edmontonians will look beyond the short-term spin and participate in an honest and positive debate about how we want our City to grow in the coming decades. This entry was posted in Edmonton Politics and tagged Charles Allard, Michael Phair, Patricia Mackenzie, Stephen Mandel on August 27, 2010 by Dave Cournoyer. 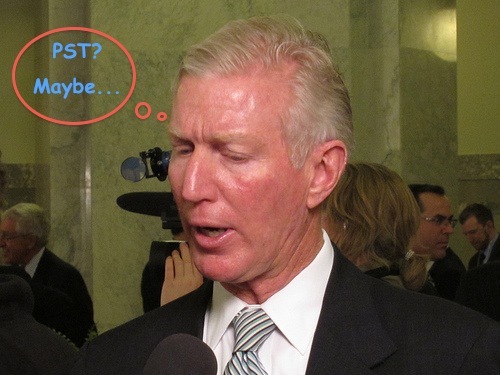 – Finance Minister Ted Morton is not ruling out the idea of a Provincial Sales Tax for Alberta. Premier Ed Stelmach says it will not happen as long as he is in office. The Government of Alberta remains in a $4.7 billion deficit. – Over 500 people packed a hall in Vegreville to voice their opposition to the construction of new electrical transmission lines. Although he is the MLA for this area and was invited to the meeting, Premier Stelmach declined to attend. – Michael Walters is the new Executive Director of the Alberta Party. Mr. Walters previously served and excelled in his role as Lead Organizer for the Greater Edmonton Alliance from 2004 to 2010. – Former City Councillors Michael Phair and Patricia Mackenzie have written an excellent opinion-editorial in the Edmonton Journal explaining why they believe redeveloping the City Centre Airport lands will benefit Edmonton. – Reboot 3.0 is scheduled for November 5 and 6 in Edmonton. – Jeffrey Coffman is seeking election to Lethbridge City Council. Mr. Coffman previously served as an Alderman from 1995 to 1998 and later as Chief of Staff to MLA Ken Nicol. Bridget Mearns, daughter of Lethbridge-East Liberal MLA Bridget Pastoor, has announced her campaign for Lethbridge City Council. Also in the running is long-time conservative activist and college professor Faron Ellis. – What motivated Wildrose leader Danielle Smith to jump to the defence of a failing private health clinic? – Quebec Conservative MP Maxime Bernier has recaped his summer visit to Edmonton and his encounters with Wildrose leader Ms. Smith and Edmonton-Strathcona Conservative candidate Ryan Hastman. Mr. Bernier’s former colleague Ken Epp is now the vice-president of the Strathcona Wildrose Alliance association. Mr. Epp represented the Elk Island and Edmonton-Sherwood Park constituencies from 1993 to 2006. 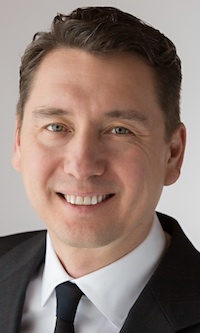 – Michael Butler has been acclaimed as the federal Liberal candidate in Edmonton-Mill Woods-Beaumont. Mr. Butler has ran twice for the NDP in 2008, federally in Mill Woods-Beaumont and provincially in Edmonton-Rutherford. The riding has been represented by Conservative MP Mike Lake since 2006 after the retirement of long-time Liberal MP David Kilgour. This entry was posted in Alberta Politics and tagged Bridger Pastoor, Bridget Mearns, Danielle Smith, David Kilgour, Ed Stelmach, Faron Ellis, Iris Evans, Jeffrey Coffman, Ken Epp, Ken Nicol, Maxime Bernier, Michael Butler, Michael Phair, Michael Walters, Mike Lake, Patricia Mackenzie, Ryan Hastman, Ted Morton on August 26, 2010 by Dave Cournoyer. macewan university – the future of story conference & alberta’s political narrative. I had a great time participating in the Future of Story Conference organized by MacEwan University‘s School of Communications this weekend (you can read tweets from participants at #futureofstory). I was lucky to be invited to join a panel discussion focusing on “the political narrative” that was led by writer Curtis Gillespie and included panelists Michael Phair (Edmonton City Councillor from 1992 to 2007) and Patricia Misutka (Chief of Staff to Mayor Stephen Mandel). Our discussion topic led to some very interesting conversation about the role (and dangers) of narrative in politics and the differences between narrative, spin, and ideology. Opening the discussion, I offered my thoughts on how the political narrative and mythology of Alberta has been translated into how Canadians from other provinces see us (a topic that I have recent written about). A sincere glance at our province will make it easy for anyone with common-sense to debunk the myth that Alberta is a cultural, societal, and political monolith. Michael Phair spoke about the political narrative that dominated the run up to the 1995 municipal election. At the time, it was largely believed that Edmonton was falling behind and needed to elect a new and “business-friendly” Mayor. Two mayoral candidates, including Bill Smith, adopted this narrative as central to their campaigns and in October 1995, he was successful in unseating two-term Mayor Jan Reimer. Upon entering office, Mayor Smith discovered the limitations that municipal governments have to creating immediate economic growth and attracting businesses. This political narrative pigeon-holed Smith, who over his three-terms in office was typecast as solely being the “business Mayor” or “cheerleader” for Edmonton. Mr. Phair pointed out that this narrative overshadowed many of Mayor Smith’s accomplishments – including the leading role he played in ending smoking in bars and restaurants in Edmonton. Interestingly, current Mayor Mandel, who arguably has just as much business background as his predecessor, has successfully avoided being overshadowed by this political narrative. Patricia Misutka gave a really good example of how the vacuum of leadership from the provincial and federal orders of government has allowed municipalities across the world to become leaders in environmental and sustainability initiatives. Having attended the ICLEI World Congress in Edmonton last summer, I completely agree. The panel also generated some interesting discussion on the challenges of differentiating political narrative and political ideology. When describing the various political narratives that Alberta’s Progressive Conservative Party has been successful in creating since they were first elected in 1971, a number of audience members pointed out that the root of the political narrative that defined Premier Ralph Klein‘s government was rooted in the ideology of Margaret Thatcher and Ronald Reagan. I argued that Premier Klein’s decision to embrace a harder-line fiscal conservative agenda was less based on sincere ideology than it was in ideology of convenience. It was pointed out by one of my fellow panelists that the first politician to begin crafting that narrative in Alberta was Liberal leader Laurence Decore. As is fairly well-known in Alberta political circles, Premier Klein understood that Albertans were embracing that narrative and he embraced the idea and branded it as his own. Under this narrative, his party was re-elected in 1993, 1997, and 2001. Arguably, after the deficit and debt has been paid off, Premier Klein’s government drifted through the 2004 “Kleinfeld” election until his retirement in 2006. One of the biggest challenges facing the government of Premier Ed Stelmach is its lack of defining purpose, or political narrative that Albertans will embrace. In the absence of any dominant narrative, there are a number of citizen groups and political parties competing to craft their own political narratives (or spin) around the upcoming provincial budget, including the Taxpayers federation, Join Together Alberta, the Parkland Institute and the Wildrose Alliance. This weekend, the Manning Centre for Building Democracy hosted a Conference on Alberta’s Future, where among many things, crafting various shades of blue political narratives for our province were discussed (you can read more about it here, here, here, here, and here). In a couple of weeks, citizens involved in Reboot Alberta will gather in Kananaskis to discuss other new ideas in crafting a new political narrative for our province. We are only two months in and 2010 already looks like it is going to be an interesting years for politics in Alberta. Overall, The Future of Story conference generated some excellent discussion about the future of the craft of storytelling and brought together over 250 interested and passionate storytellers to share their ideas. This entry was posted in Bill Smith, Curtis Gillespie, Jan Reimer, Laurence Decore, Michael Phair, Patricia Misutka, Ralph Klein and tagged Bill Smith, Curtis Gillespie, Jan Reimer, Laurence Decore, Michael Phair, Patricia Misutka, Ralph Klein on February 8, 2010 by Dave Cournoyer.